If Texas and Louisiana and a bunch of other southern red states wanna secede, let ’em! First, no one – including one state – should be forced to remain part of the union if they seriously don’t want to be. But more important, the rest of the country would be better off without them. They take more than they give, drink more than they spill, and push the country on a wrongheaded rightward course such that we would be better off without. It is my opinion that the very richest and farthest right of the citizenry would like a return to monarchy. Once you have all the money in the world, what other evidence of your magnificence is there? Since a monarchy exists only because God wants it, a coincident theocracy is practically a given (cf. Western European history). It is the popes and bishops who then bestow God’s ultimate prize: a kingdom. The Koch brothers would make fine examples of dukes, tall and resplendent in scarlet and ermine, at the coronation of the Bush Family Dynasty. 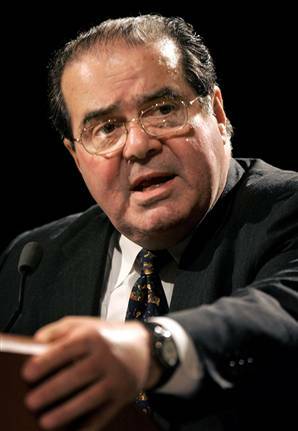 Scalia doesn’t believe in a right to secede. Typical narrow-minded conservative, trying to deny basic rights. . . .